The World Health Organization has reported that more than 1 billion people around the world smoke. As a result, cigarette smoke and tobacco products are directly or indirectly responsible for the more than 5 billion lives taken each year, due to tobacco-related illness. 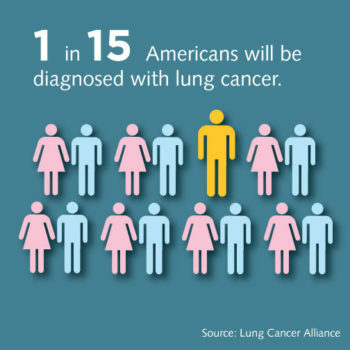 That’s why organizations worldwide raise awareness about lung cancer each November. This year, we’ve worked with the Mesothelioma + Asbestos Awareness Center to bring attention to the various contributors to lung cancer and what we’ve done to contribute to prevention. Tobacco consumption varies in numbers, globally, yet tobacco remains the primary culprit responsible for most lung cancers. The average adult at rest will breathe approximately 23,040 times per day. For those who smoke or are exposed to smoke, each breath welcomes hundreds of carcinogenic substances to the lungs, altering lung tissue almost immediately. At first, the body may be able to repair damage caused by tobacco smoke, but with each repeated exposure from every breath, damage continues. Normal cells that line the lungs are repeatedly damaged causing abnormal cell activity over time and eventual cancer development. With the real and grave effects of tobacco consumption, we understand that public health is about prevention. WellShare’s tobacco education programs have been offered in Duksis (Islamic schools) to inform children and prevent generational exposure to and use of tobacco. Each class educates classes of approximately 20 students about the importance of preventing tobacco exposure and consumption. A few favorite messages amongst students include “Say no to shisha” and “Tobacco is bad for your teeth because you’re going to get gum disease.” Additionally, WellShare’s Young Achievers Somali youth program offers tobacco prevention and education and has positively affected over 900 refugee and immigrant youth in the Twin Cities area. Asbestos is a natural, silicate mineral, which similar to tobacco, is only harmful to human health once inhaled or consumed in any form. Once consumed, the harmful fibers of the mineral can attach to the delicate lining of the lungs, abdomen or heart, causing irritation and development of scar tissue. Over time, these scar tissues can develop into asbestos-related disease, including mesothelioma, asbestosis, lung cancer and more. Because asbestos is natural and was or still is used in various parts of the world, it is crucial to avoid exposure to asbestos to safeguard health. Radon is a harmful odorless, colorless gas, which is a result of the natural breakdown of radioactive decay of uranium and thorium contained in rocks and soil. Due to the environmental nature of radon, its consumption is nearly unavoidable; however, it is important to prevent prolonged or repeated exposure to radon gas, as it is the second leading cause of lung cancer, following cigarette smoke. At WellShare, our projects are developed to address large public health problems including obesity, tobacco use and family planning among others. Ultimately, we like our efforts to inspire and drive the practice of public health while raising awareness to prevent disease and enhance quality of life. This lung cancer awareness month, we are raising awareness of tobacco and other carcinogens, but we strive year-round to raise awareness and inform others. To learn more about our projects, to obtain resources or to get involved with WellShare, follow us on Facebook and consider the support of WellShare while holiday shopping this year!